Last week Brad was out hunting. He came home Sunday in a triumphant return with a huge buck in tow. Every year Brad gets venison, we have a game plan, or rather he has a game plan, I am just a supportive bystander. He gets half the meat cut into the usual cuts, roasts, back straps etc. 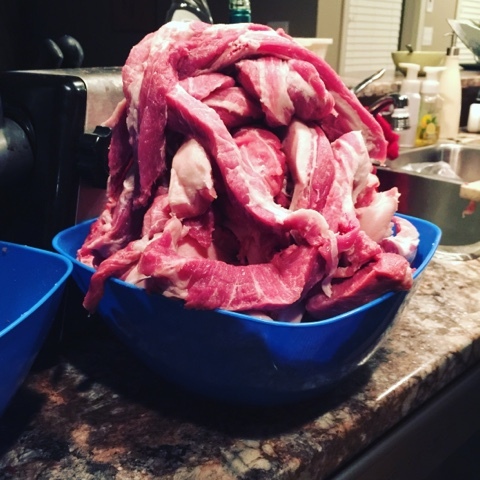 The remainder he puts through a meat grinder along with some pork and turns it into sausages. He had 70 lbs of venison combined with 70lbs of pork. In case you aren't so great at math, that will become 140 lbs of sausages. The picture below is one of 14 or so bowls of meat he was grinding up. He ran into a little trouble early on in sausage fest 2015. There is a very specific brand of casing that Brad likes to use which is produced by a company in Headingly. He ususally buys them at Cabela's but they were sold out, as was Canadian tire and that Outfitters place on St. James street. Why is this a crisis? Well, Brad has been making sausages for years and has found that if you make the sausages while the meat is fresh, they are much better. If you freeze the meat (because you don't have time to make the sausages) then you have to thaw the meat. Newly made sausages from thawed meat have to be cooked before you can freeze them again. That process tends to dry them out a lot. Which is why it was a time sensitive matter to get the casings; he didn't want to have to freeze the meat. By reading the above paragraphs you have probably heard more about sausage making than you ever have before - Isn't learning fun? Brad called around and found some in Portage La Prairie. He was all set to make the trek out there, but decided to make a phone call to the company instead. Turns out at their production facility they have some casings available for wholesale. They generally don't sell directly to the public, but they made an exception. Brad headed out to the warehouse and bought a bunch at wholesale prices. SWEET. Brad spent about 15 hours this week grinding the meat, mixing the pork/venison awesomness, adding the spices and putting it back through the grinder into sausage casings. This year he made a whole bunch of different flavors; Italian, Garlic, Breakfast and I think he also did a Bratwurst or something similar. His hands and forearms have taken on Popeye like proportions from all the work, but it was a success! 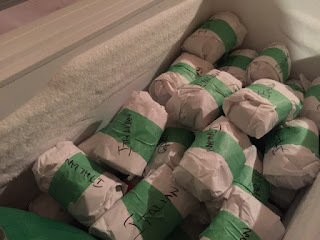 We now have 500+ sausages tidily tucked away in packages of 6 in our downstairs freezer. This freezer is where we keep our venison and it was empty when Brad went hunting. It is now full.... of sausages. We had to bring the venison roasts and other cuts to the freezers upstairs because there was no room. What a nice problem to have. I have friends who when they hear the word "venison" they freak out and won't touch a sausage(we eat them like smokies in the summer) with a ten foot pole. So we stopped mentioning it and you know what? Our BBQ's rocked the house and everyone loved the sausages. So there. Now that our freezers are full we are ready to hunker down for winter.